Facebook is testing and will soon launch Facebook Exchange, a real-time bidding ad system where visitors to third-party websites are marked with a cookie, and can then be shown real-time bid ads related to their web browsing when they return to Facebook. This retargeting option could be a huge money maker for Facebook as it will allow for more relevant direct advertising. For example a travel site could serve ads about a flight to Hawaii to someone who almost bought a flight on their site. Advertisers might pay big premiums for highly-accurate targeting. Users will be able to opt out of Facebook Exchange via third-party demand-side platforms, but they can’t opt out of the program completely from within the social network. Facebook just notified TechCrunch that Exchange is currently in testing with eight advertising demand-side platforms, and it will become more widely available in the next few weeks for traditional Facebook sidebar ads charged at cost-per-thousand-impressions, but not Sponsored Stories or mobile. The demand-side platforms currently testing Facebook Exchange, or FBX as some Facebook employees are calling it internally, are: TellApart, Triggit, Turn, DataXu, MediaMath, AppNexus, TheTradeDesk, and AdRoll. Facebook’s Annie Ta tells me the idea behind Exchange is to let advertisers show users more relevant ads. To date, Facebook has been generally viewed as a home for institutional or brand advertising. However, it’s seen as much less useful to direct marketers than search ads because users on Facebook haven’t shown purchase intent as when they search for a related keyword on engines like Google. Facebook Exchange could change all that. For example, Ford could drop a cookie on a user who looks at the new Escape SUV on its website, but doesn’t request a local quote. Then Ford could bid to show that user ads stating “Ford Escape: Just $21,000″. These would be much more relevant than generic Ford ads showing sedans or trucks that the user might not be interested in. And Ford would likely be willing to pay a high price to reach that qualified lead. Facebook may make some users uneasy in order to cash in on this new revenue stream, though. Cookie-based ad retargeting is common across the web, and Facebook is going the protecting privacy by not allowing advertisers to combine cookie retargeting with the with the extensive biographical, social, and behavioral data Facebook has on its users. Still, some people just dislike being targeted. Those people will be able to use a third-party opt-out on the sites of demand-side platforms to stop receiving the cookies. However, I asked if Facebook would offer users an easy, one-click way to deny the social network the ability to target them based on cookies from all DSPs, and it said that won’t be offered for now. That’s in part because it can’t control whether DSPs drop cookies or not, though it can make the call of whether to use them. Not allowing retargeting to be combined with Facebook’s own ad targeting data is a pretty strong privacy protection, and makes Facebook Exchange ads the same as any other retargeted ads around the web. If investors were looking for clues as to how Facebook could ever get to the $104 billion valuation it IPO’d at, Facebook Exchange should excite them. It shows Facebook is willing to shift towards slightly more aggressive advertising mechanisms. While just a year ago Facebook ad targeting was only based on user-entered personal information and interests, now both browsing behavior and activity within apps, for example listening to a specific artist on Spotify. Facebook already leads the overall US display advertising market which totaled $12.4 billion in 2011, with the social network’s share of market revenue growing to 14% in 2011 from 11.5% in 2010. If Facebook Exchange gains traction, Facebook could beat eMarketer’s estimate that Facebook’s share will grow to 16.8% of the predicted $15.39 billion market in 2012. But most importantly for the long-term health of Facebook, FBX means that users could see more ads for things they actually want to buy, rather than viewing the ads as annoying distractions. Social Media: Do You Know Where Your Target Audience Is? As a marketer, do you know whether your target market is active on social media platforms? If so, do you know which social media entities your customers frequent most often? The proliferation of social media sites and increased social media usage means there’s a good chance that your gut feel about your audience’s social media preferences may not be correct. Are you willing to bet your budget on it, especially when about nine out of ten marketers uses social media to achieve marketing results according to eMarketer? Social media isn’t just for kids any more! 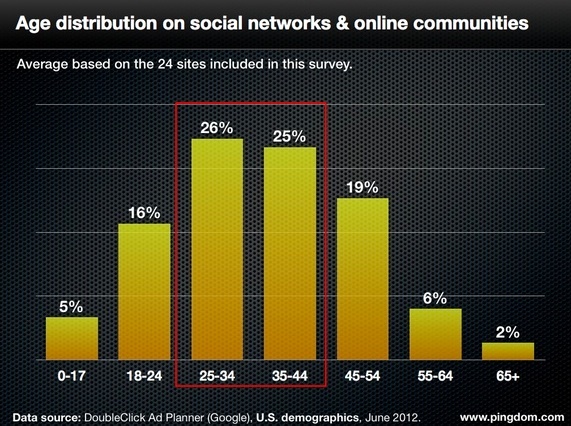 Over half of social media participants are between 25 and 44 years old, according to data from Pingdom. Further, the percent of participants under 17 (5%) is not that much larger than the percent of participants over 65 (2%). This is surprising since the lower cohort includes high school students. 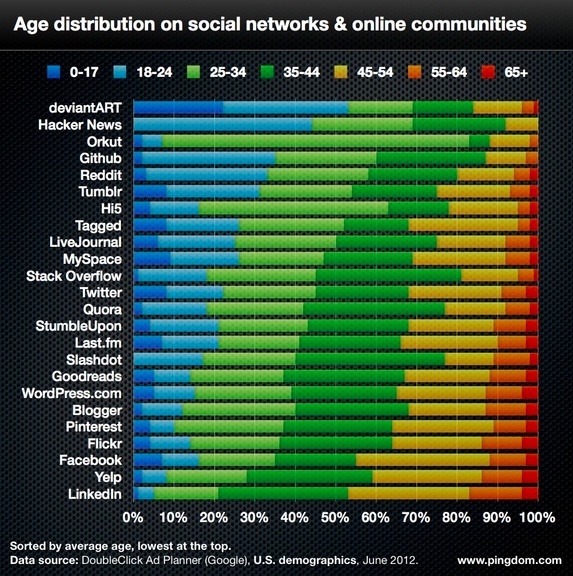 With two thirds of users over 35, the average age of a Facebook user is 40.5 according to Pingdom. By contrast just over half of Twitter users are 35 or older. The average age of a Twitter user is 37.3 years old, a number that’s declined in the last two and a half years. Almost four-fifths of LinkedIn users are 35 or more. The average user is 44.2. 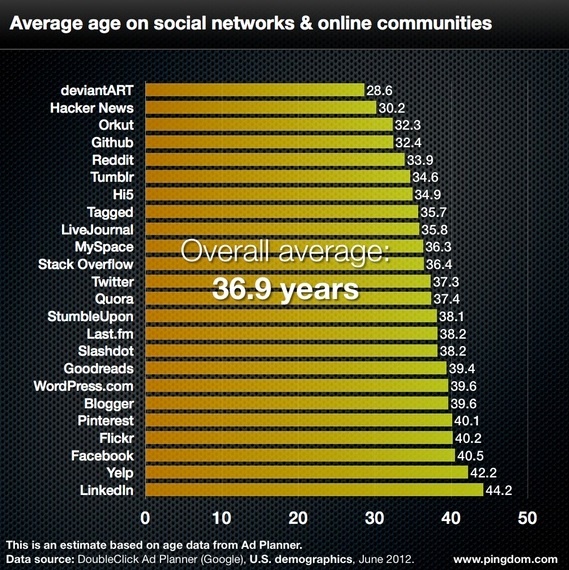 Given that LinkedIn focuses on professionals, it’s not surprising that its user base is older. Social media sites tend to attract slightly more women (51.25%) than men (48.75%). Interestingly, Facebook and Twitter have a more skewed divide, 60% female to 40% male. This makes sense since women socialize more in real life. Further, despite more equality in terms of family responsibilities, women tend to make more of the social engagements. Almost 80% of Pinterest users are women, according to Pingdom, making it the most female-dominated site. As a magnet for online scrapbooking, fashion styles and home design, it’s no surprise Pinterest attracts so many more women. To increase male usage, Pinterest would need to show marketers how to develop and share content appealing to men such as sports and cars (assuming a PG-approach). 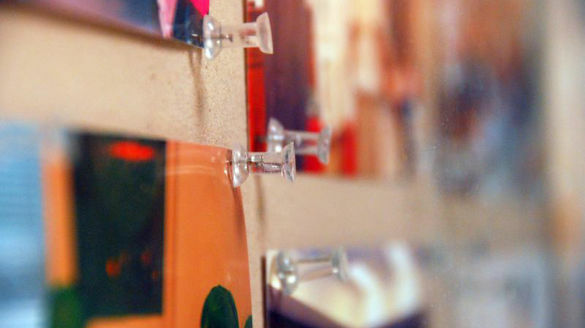 The challenge is that these photographs and images often have copyright and licensing issues. By contrast, just over half of marketers are using Twitter. What is surprising is that slightly more than a third of marketers use YouTube since video is an important medium for showing off 360° product views and providing useful how-to information. BTW, when assessing the Pingdom data, it’s important to note that YouTube, the second biggest social media site, isn’t present. The reason for this is that many tracking services classify YouTube as a video site along with NetFlix and others, not with social media entities. When using social media for marketing, it’s critical to understand your target audience, how they engage on social media platforms and where they spend their time. Just looking at a top level could be misleading. What do you think of these research findings? How are you planning to use social media in the coming year?